Madison Throws Club is dedicated to TRACK and FIELD THROWERS in Wisconsin and beyond who want to take their skills to the next level. Middle School, High School and College - beginner through advanced; MTC has been helping hundreds of throwers become their best since 2002. MTC offers summer, fall, and winter sessions, one-on-one coaching and small and large group clinics year-round in Madison, Wisconsin. MTC alumni continue to make improvements as the college outdoor season continues. Molly Griep, University of North Dakota (FR), had a big day in her 3 events. Molly threw over 43' in the shot rotating for the first time in a meet, went 149'10" in the Discus and threw 160 in the Hammer Throw. KeKe Burks, University of North Dakota (FR), improved on her Hammer throw moving her P.R. up to 164'. 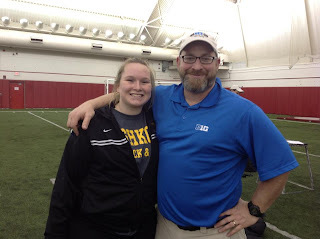 Kailee Kamps, University of Minnesota (FR), had her first meet of her collegiate career and opened with at discus throw of 141'7". Great job to all! Many MTC alumni have headed outdoors for their college seasons. I wanted to wish everyone the best! Good Luck and Throw Far! Jason Zahn opens with a new Collegiate DISCUS P.R. 167-2. Justin Barber hits a new Discus P.R. 180-9. Weather and COMPETITION are warming up! As the weather gets warmer the State Honor Roll continues to heat up as well. Madison Throws Club throwers continue to move up the list. Keep up the good work everyone. BIG MOVE of the week Boys: Riley Budde, Beaver Dam (sr.) moves to number 1 on the Boys Discus list with a new P.R. and school record. BIG MOVE of the week Girls: Samantha Noennig, Hartford (fr.) broke her school record in the discus at her first career meet competing in the event. With many outdoor meets getting canceled because of this strange Wisconsin 'spring' weather the Honor Roll lists are bound to see lots of changes in the coming weeks. But I wanted to give a shout out to all of the MTC athletes who are near the top of the state with their performances so far. Keep working hard everyone. There were some strong performances turned in at the TFA meet on Saturday, April 6th in Whitewater. The 2013 TFA had the biggest field of shot put competitors I've seen in many years. Several Madison Throws Club members competed well in the last indoor meet of the year. Many MTC throwers took part in the Boys Madison West Relays indoor meet on Saturday, 30th. Congrats to friend of Madison Throws Club, Kyle Whaley (Tomah, sr.) on winning the Class B Shot Put and to Adam Stiner, Sean Bruesewitz, A.J. Musser on new PR's! The Madison ALL-CITY Indoor Meet was held at the UW SHell on Saturday, March 23rd. Many Madison Throws Club members competed and competed well. While Corinne Franz' win in the Girls Shot Put is notable. My mind is stuck on Jeremy Gartlands 6 foot P.R. in the shot, this after having a 2 foot P.R. the week before- 2 meets into the 2013 season and Jeremy has taken his Rotational Shot Put technique 8 feet past his best performance of 2012. Ryan Bruesewitz also set a new P.R. by 6 feet. I can't make this stuff up. Keep up the good work everyone! Many MTC athletes competed for the first time in 2013 this past weekend as the High School Track and Field season has begun in WISCONSIN. The snow looks like it will keep us indoors for awhile and discus takes the back burner while throwers focus on the SHOT PUT. UW-Whitewater played host to the Nelson Daniels Classic Friday, March 15 and Saturday, March 16. MTC throwers showed that the off-season of hard work can get you off to a fast start. Haley Houser (Stoughton, sr) won the Shot Put in the Small School meet Friday. While Riley Budde (Beaver Dam, sr) and Corinne Franz (Madison Memorial, sr) won the Big School Shot Put competitions on Staurday. Will thinking about discus melt the SNOW? I am very excited to say that Madison Throws Club is moving on from our first 10 years into our second decade. All of the hard work, athletes from the State of Wisconsin and beyond have put in this past off-season, is now being put into action as the 2013 WIAA Track and Field season moves into its second week of practice and first week of competition. I wish everyone the best of luck in competition - remember its a long season and its only just begun. Keep your eyes on your intermediate goals and your long term goals will become possible. Who will follow last year's State Champions from MTC? Luke Sullivan set the WIAA State Discus Record with a throw of 193'3" at the 1993 WIAA State Track and Field meet. The record still holds up today, 20 years later. Luke went on to be a 4 time All-American at UCLA and since has gone on to a share his expertise with hundreds of throwers at his Annual Clinic here in Wisconsin. Luke now coaches in Phoenix, Arizona...I can't wait to have him back in Madison! The best thing about working at the UW Badger Track meets is I get to see so many of my MTC alumni compete for their colleges. Great to see Heather Clankie back in discus circle for UW-Oshkosh last weekend. Best of luck as the NCAA outdoor season begins, to you Heather and all of the MTC alumni competing out there. Also a shout out to all of the MTC Alumni who have graduated from college and are now passing it forward by COACHING! Good Luck this season Coach Larry Ehrhorn (Mt. Horeb), Becca Kitzman (LaCrosse Central), Dana Thompson (Sugar River).